I recently dug up an old presentation on calcium myths I presented back in 2011 at Expo West – and wanted to share it with you! The audience was comprised of health store owners from around the US. Watch the video below or listen to to the audio recording. Dean: Good. Okay, great. Great. Well, thank you so much for taking your precious time to come here and take a look at our little presentation. I hope that you’ll find it really helpful. I think that you will. My name is Dean Neuls. I’m the founder of AlgaeCal Inc. My world has been calcium for the last nine years. That’s all that we have done since 2002. And during that path of getting up in the morning and working on calcium issues until the end of the day for the last nine years, I’ve learned a few things. I’ve become a student. I wouldn’t call myself by any means an expert, but a student of calcium and bone health. And I would like to share a lot of those things with you. So actually let me just ask…I wanna get a little understanding of who we’re talking to here. How many of you actually work in a health food store? Maybe you own one or work in…yeah, so quite a few. And how many of you have heard of AlgaeCal before at all? Yeah, oh, most of you. Okay, good. All right. Bill, you’ve heard of it? Dean: Okay. All right, here’s a few statements. I’d like to ask you what you believe. Do you believe that most calcium comes from an edible source? By a show of hands, how many of you think calcium comes from edible source? One would think, “It’s going in your body. It ought to be edible.” All right, how about this statement? Calcium is calcium is calcium. It doesn’t matter what the source. Whether it comes from calcium carbonate, calcium citrate, calcium citrate malate, essentially the effect, aside from some small absorption differences, is the same in your bones. True? Not true? Dean: All right, next one. Typical calcium formulations are complete. Calcium’s probably the first dietary supplement on the face of the planet. Had some 60 odd years to get it right, you’d think that they would be fairly complete by now. No? No, a lot of heads waving. Okay, how about calcium absorption rate? By a show of hands, if you go to the health food store and you want to pick up some calcium, is it important to look for a highly absorbed calcium? It is important? Yes? Dean: Yes? Okay, you’re gonna hate me by the end of this. One last one, does calcium support the increase of bone density in adults, not children of course? Does it? Yes? No? Yes. Okay, I think I’m talking to the right audience here. I can see that. We’ll go through each one of these now in a little bit of detail. Folks, all of you know where your food comes from, right? You spend three times more to buy organic sometimes. Sometimes you choose to buy conventional, but you know whether you’ve bought conventional regular food or whether you’ve bought organic. Your eggs are free-range, or organic or traditional sort of eggs. 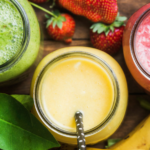 And when you go and you buy a vitamin C supplement, you know typically whether you’ve bought ascorbic acid or whether you’ve gone ahead and paid the extra to get it from camu camu or acerola berries or some other wholefood source. 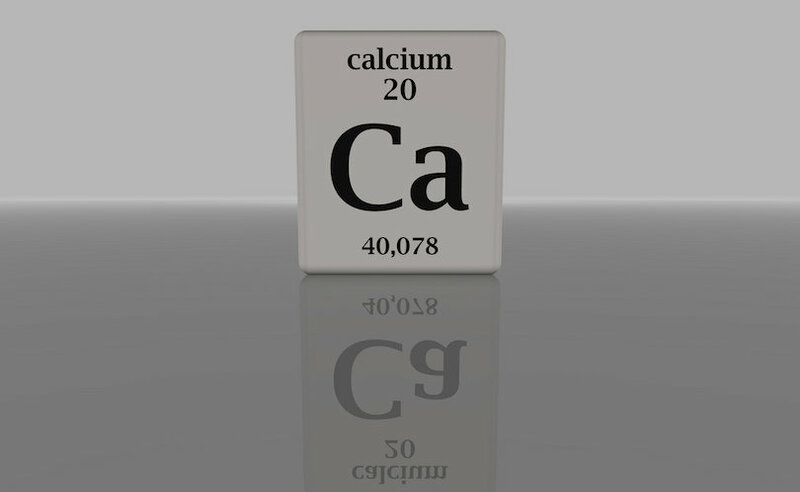 So do you know where your calcium comes from? I mean, not the pretty label that says it’s ABC brand, but where does it actually come from? Well, you may be a little bit surprised to find that more than 90% of calcium supplements are made from either mild marble or limestone. That’s a little bit odd, because you would think nobody thinks about eating marble or limestone and yet our calcium supplements are made from it. Dean: …rock. Okay, and that represents more than 90% of calcium supplements. I’m being conservative by saying 90%. Would you eat a lemon and limestone pie? Probably not, right? How about this one? The next time you’re working on your marble countertop and you’re fixing yourself a nice peanut butter sandwich, are you ever tempted to just take a nice little mallet and knock the corner off of the table, off of that marble countertop and throw it in your sandwich? Hasn’t happened, has it? There’s just no temptation there at all. Same thing with a cherry and chalk ice cream. It’s ridiculous and that’s the point. It’s not something you would really think about doing. So in the sense, in terms of calcium supplements, we have been in the Stone Age, and we do have an opportunity and alternative to stone-based calcium. funny, almost brain-like, almost coral-like, but in fact, it is a plant. It’s quite hard and very, very heavy. These balls, by the way just to give you a perspective of the size of them, are about the size of a tennis ball or a kiwi fruit, somewhere in that size. You can see the pinkish pigmentation. That is used for photosynthesis. It feeds itself as any plant does using photosynthesis. By the way, brownish, greenish seaweed that’s attached to it is not harvested and used in the AlgaeCal. Just the round, ball part. This is what it looks like in the beach. It rolls up in the beaches of South America. 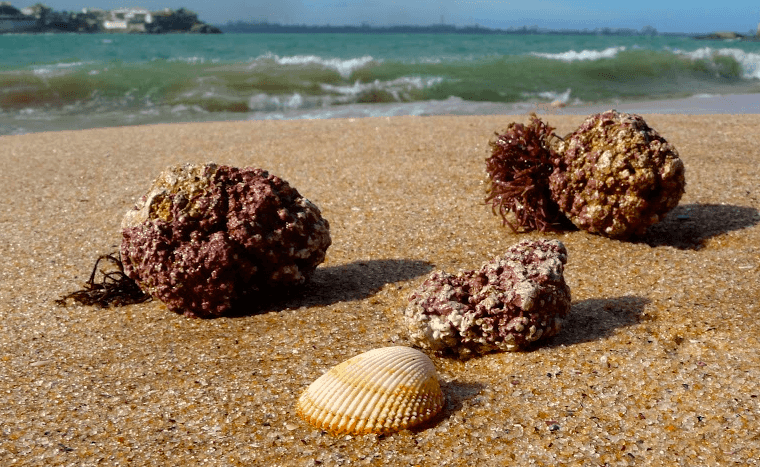 The ocean coughs it onto the beaches, and it’s a very simple process to harvest. You’ll look for the pink ones because they’re living. The whitish, creamish colored ones are dead. They’ve been on the beach for more than 48 hours in the sun and then they die. And so we pick just the living ones and we have this wonderful plant source that is not dead and it’s not inert but a living plant. It’s called Lithothamnion superpositum (or Algas Calcareas as the locals call it), and it’s harvested in a very ecological way. We have the local indigenous folkswalking up and down the beaches after the tide is out, and they pick the balls. It’s really high-tech. You’ve got to follow me on this. They reach out, they pick these balls and they put them in a white bucket. And then they take them back to the factory where they’re washed and rinsed in fresh water, dried in the sun and then the entire algae is milled into a powder. So you have in effect, not in effect, you have a wholefood, an entire plant that’s milled into this powder. And that powder has approximately 30% elemental calcium, so it’s very high. Calcium citrate is about 21%. Calcium carbonate is 40%. So it’s right in between calcium citrate and carbonate in terms of its amount of elemental calcium. It’s about 30%. The magnesium in there is around 2% to 4%, and it has a number of other important minerals, which we will show you later. By the way, have any of you had any feedback at the health food store level that calcium causes cardiovascular events? A study that came out last summer, do you have folks coming into the store and they want to return their calcium supplement? Okay, so the first myth, “Calcium comes from edible sources,” unless you consider rocks edible, that is indeed a myth. How about the second one? That calcium is calcium is calcium irrespective of the source, whether you take calcium carbonate, calcium citrate, calcium gluconate, bisglycinate, whatever -ate, it’s going to have a difference to your bones. Is that a myth or is that a truth? That calcium is calcium is calcium irrespective of the source, whether you take calcium carbonate, calcium citrate, calcium gluconate, bisglycinate, whatever -ate, it’s going to have a difference to your bones. Is that a myth or is that a truth? Dean: Well, the truth of the matter is that whatever the form of calcium it is, when you swallow it, and it dissolves in your stomach and then it goes down into your intestina l tract, goes through and into your bloodstream, as it goes through the intestinal tract, the calcium is separated from the carbonate, from the citrate, from the citric malate, so all you have is a calcium ion, just pure calcium going through your blood where it can be used in all of your tissues to help your brain, to help your heart pump, your muscles to flex, all your bones to build, all of those things. And it’s just the calcium. So the argument has been traditionally and is that calcium is calcium no matter what the source aside from some small absorption differences, which we’ll talk about in a little bit. Well, today, as of June of 2010, we can say calcium was calcium. The wall of light, all those calcium supplements that are out there, they have all performed exactly the same up until June of last year. What happened then? Well, there was a very important study that came out. It was a human osteoblast study. We call it in-house. It was done by the University of Connecticut. We had a Harvard Medical School principal investigator in the study, so it’s a very significant, little study, although it was an in vitro study. They did use human osteoblast cells. That is human bone building cells. And they treated those human cells with AlgaeCal, with calcium carbonate and calcium citrate. And they looked at the reactions. Now with most scientific studies with similar sorts of ingredients, you would expect maybe a small difference, a couple of percentage points, but we didn’t see a couple of percentage points. We saw a 200% to 400% difference in mineralization of these bone-building cells, proliferation of these bone-building cells and there was a large reduction in the oxidation of the bone-building cells as well. So it was a significant study. It’s published in cellular and molecular biochemistry if you’d like to look it up. A couple of charts showing the same sort of thing. All right, so calcium traditionally has been calcium no longer since that osteoblast study came along. And there are more human studies that we’ll talk about in a little bit that will also separate AlgaeCal from the other herd of calciums out there. But let’s first examine the next step, and that is that typical calcium formulations are complete. Calcium, as the first supplement, started roughly 60 years ago or something like that. And yet today when you look at the shelves, the most common calcium formulation is what? Man: Calcium and vitamin D.
Dean: Calcium and Vitamin D followed by cal/mag, vitamin D. Very simple formulations. Well, there’s some several studies, we won’t go through the details of them, but several studies where they took a group of post-menopausal women, gave them calcium. Another group, they gave them calcium but added some trace minerals like copper, and zinc, molybdenum. And in a couple of these studies, they showed that there was a better effect on bone density when you added the trace minerals. So you’d think that there would be some radical changes in the way we formulate calcium supplements but not really. It’s all about price in many cases, and tradition and marketing. So the science is showing one thing. The market is getting another thing. I, a couple of years ago, spent a lot of time and looked through the National Medical Library, PubMed, and did a search on all the minerals that I could find within a reasonable amount of time, all the minerals that had science to support a role in bone health. And it was quite astonishing, because although calcium is always promoted, there is a whole host of minerals, in fact, 13 of them, that are shown to play an important role in bone health. I remember seeing a study, because actually the FDA was involved in a long time ago on vanadium. Does anyone think of vanadium and bone health? And yet in this study, they deprived goats of vanadium from their diet. It’s this tiny trace mineral. You have very, very little of it in your food, and they deprived these goats and then they had all twisted bones. And the babies were born all deformed, so it’s really an interesting thing to see that there are so many trace minerals that are involved in bone health. Of the 75 odd minerals that exist on the planet, 13 of them are involved in bone health. And interestingly AlgaeCal naturally contains all 13 of these minerals. I was quite pleasantly surprised as the owner of the company to discover that all 13 of them happen to be naturally occurring in this complex and in relatively similar proportions to what’s in human bone. In other words, calcium is by far the biggest, magnesium is number two and then the trace minerals in smaller amounts. And there’s studies on all of these. The [inaudible 00:16:04] was very important for the collagen side of the bone. There’s huge studies on strontium, and there’s a lot of strontium naturally occurring. There’s a lot of vanadium naturally occurring in AlgaeCal. So these trace minerals, I think, are perhaps the key. We don’t know for sure but it may the key to why AlgaeCal is performing so very well as you’ll see a bit later. When you think about it, it makes a lot of sense. This is the old, familiar mineral wheel that you’ve all seen, and there are interactions between all the minerals. What’s typically done today in a calcium supplement is you take large quantities of a single element, calcium, and then you try to maintain a mineral balance in your body. When it’s well-established in the literature that large amounts of calcium will actually deplete magnesium, deplete zinc, you can see from the calcium there that there’s lines going up to zinc and magnesium, and there’s a deflation that can occur if you take large amounts of calcium. And then from there, it just chain-reacts like a pinball. All kinds of imbalances can occur if you take a large amount of any mineral. So we think that a balanced approach is much more se nsible. When you analyze bone, it in fact has 70 plus minerals in bone tissue, so why feed it with just one? The other interesting aspect is the nature of the minerals. It seems that when plants take minerals out of the soil that are rather inert and not very bioavailable, not very useful, the plants transform theminto a body-friendly form that’s easily used by the body. In the sea, the same sort of thing is happening. The sea water is rich in minerals. It nourishes the algae, and the algae converts it into a form that appears to be very, very usable by our bodies. Again, you’ll see it from the studies, and it seems like there’s an interesting cycle that happens. The soil, rich in minerals, washes into the rivers. The rivers go into the oceans. The algae uses those minerals. And now we’re harvesting the algae and giving the minerals back to you, so we’re sort of reclaiming the soil in some sense. Perhaps you’ve seen these pictures. It’s what happens when you take one of the many minerals out of the soil and then try to grow plants. This is removing copper. Copper-deficiency creates the three stalks on the right. The one on the left is normal. Here’s a potato made with a magnesium-deficiency. Giant brown spots on it. 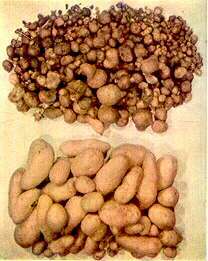 Here’s potatoes on the top and you take calcium and make it deficient versus the ones on the bottom that are more normal. I wonder what our bones look like when you just feed them one of the 13 minerals that are proven to be involved and I’m not so sure. Cheese glob anyone? All right, back to the myths. Okay, so we looked at the first two, three myths. Let’s examine the fourth one. Calcium absorption rate is important. This is where the tomatoes are gonna come up, and I have to be prepared to duck because I know that all of you believe that it’s important to choose a calcium supplement that has a good absorption rate. Let’s go into a little more detail on this. If you go on the internet and type in calcium supplement, you’re gonna find all kinds of crazy claims. There’s some calciums out there that say that they are 95% to 97% absorbed, and you shouldn’t be taking that awful calcium carbonate because it’s only 5% absorbed, those sorts of claims. Also, they go on further to say that, “You better be careful because the unabsorbed calcium is the cause of kidney stones, so you better get our super-absorbed calcium. Otherwise you might risk getting kidney stones.” And then other marketers confuse intestinal absorption with what happens in your stomach. Dissolution happens in your stomach. It dissolves the calcium and all calciums dissolve very, very well in stomach acid, 95% to 100% absorption is normal. But some of them post that as if it’s absorption. Sorry, did I say…it’s dissolution or dissolved, so 95%, 97%, 100% is normal in your stomach but not normal in your intestinal absorption. They’re two different things. Okay, so what is the truth about absorption? Now before I even show you this, I have to tell you that the information that I’m about to give you comes from the key opinion leaders in osteoporosis, the key opinion leaders in calcium. I’m talking about Robert Heaney from Creighton University, more than 200 published studies. Respected the world over as the top doctor, Bess Dawson-Hughes, and Sarah Booth and some of the other top, top, top calcium docs in the entire world. And there’s a consensus. You know how you think, “Okay, there’s an opinion on this side and then there’s other docs that disagree with them”? Not in the case of calcium absorption. They all agree because the science all points in the same direction. It all says that all calciums are absorbed between one-quarter and one-third, all of them, AlgaeCal included. One-quarter and one-third. So there’s not a huge difference. There’s not a 95%. There’s not a 5%. And calcium is inexpensive. You need a little more calcium? Just eat a little more. It’s not gonna break the bank. And, also, studies show that when you take calcium carbonate with a meal, it’s absorbed identically to calcium citrate. There’s no difference. Any calcium citrate proponents in here? You’re gonna be throwing things at me, but the truth is and studies show that when taken with meals, it absorbs identically to calcium carbonate. Another point about absorption that’s critical is that your body determines how much to absorb, and that depends on a lot of different things like cofactors, are you replete in vitamin D, do you have enough magnesium. Maybe vitamin K2 is involved, perhaps chromium. A lot of other cofactors are involved. It depends on the last time you had a calcium-rich meal. If you just ate a big bowl of yogurt and then you take your calcium supplement, your absorption is gonna be much less. And it also depends on the need of your body. If your bones are strong and in perfect shape, you’re probably not going to absorb nearly as much as if you’re osteoporotic. Your absorption rate will probably go up. And again this is all from the top docs in the field. And it’s not what I’m hearing at the health food store level. Believe me, when I go to the health food stores, they’re like, “You should buy this one, because it’s a liquid. It’s better absorbed,” or, “This one’s in a veggie cap and it’s better than the tablet. It’s better absorbed,” and all sorts of…they’re confusing absorption with dissolution. And it’s not so good, because it doesn’t really help the customer in the end and the customer is the one that loses and potentially can suffer. All right, and then the final point is that you wouldn’t want a 95% absorbed calcium if there was such a thing. There isn’t, but if there was such a thing, you wouldn’t want it because the unabsorbed calcium plays an important role in bone health, several important roles. According to Robert Heaney, it’s involved in reducing prostate cancer rates. 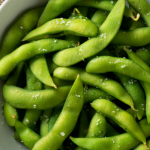 They find that it reduces colon cancer as well, because it combines with oxalates and fights toxins and carries them out in your feces, so the unabsorbed calcium is also important. All right, so that gives you a little different perspective. And a by the way, how is AlgaeCal’s absorption? Well, it’s excellent. It’s even better than most foods. We did an in vitro absorption study. 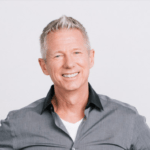 We didn’t want to spend the big bucks on human studies on absorption, because it’s an intermediate point, and a better absorbed calcium is not necessarily one that’s going to make your bones stronger. There isn’t any science to support that, so we took…let’s spend our dough in grants to universities and contract research organizations to do studies on endpoint, something that’s meaningful, something that’s real like bone density. So what would you rather have – science it’s showing greater absorption or supporting science showing an improvement in bone strength? Dean: Bone strength, right? If you have the bone strength, automatically you know it’s well-absorbed. All right, so your focus should be on bone strength research, and that’s where we spent our focus as well. All right, so we know that most calcium doesn’t come from edible sources. We know that there is a difference in calcium salts out there in terms of their results. We know that typical calcium formulations are incomplete, and we know that the calcium absorption rate is a big non-issue. You shouldn’t be concerned about it. All calciums absorb similarly. And the final myth is that calcium increases bone density. Do you believe calcium increases bone density in adults? Well, let’s understand. When you are born and you start to build your bones, your bones continue to increase in density until around age 35 to 40, somewhere in there. You plateau out, you’ve reached the top, and then from that point, it’s all downhill. All of us lose about 1% a year…women 1% a year almost exactly. Men a little bit less, about 0.8 of a percent every year until you die. So if we live long enough, all of us get osteoporosis. So of course the key is to get as high up to the peak bone density as you can, so that the ride down, you still have some bones left before you die. All right, so I told you that, because when you look at the studies on calcium supplements, they show that the best you can do with calcium and vitamin D, and it doesn’t matter which one. Point to any one on the shelf, they’re all calcium carbonate, citrate, malate, gluconate, lactate. They’ve all been studied, and they all show that they just slow the bone loss. So instead of losing 1% a year, you’ll lose a half a percent or you’ll lose a quarter a percent, something like that. I have a couple of meta studies. If anyone is interested, I can send you the meta studies, which summarizes the results of some 6,500 post-menopausal women on bone density. All calcium studies, I forget the number of calcium studies, like 50 or more calcium studies, and they conclude that calcium with vitamin D slows bone loss. And it kind of makes sense as well, because if you’re losing calcium every year at a rate of 1%, all you can do is replace it. You can’t go above the replacement value. So calcium supplements slow bone loss. That’s all. And by the way, if you’ve seen studies that say that there was an increase in bone density, have you seen those kinds of studies? It’s an increase versus the placebo group. So you have the calcium group versus the placebo, and they report it as an increase but it’s not an outright increase in bone density. The people that increase in bone density, they just increase versus the placebo, which is losing. So this side lost, this side lost, but not as much. Understand? Dean: Yeah. Okay, but there is some good news and that is that slowing your bone loss is not a result and you need to accept we can do better than that. Okay, so we did two human studies with AlgaeCal, and they were just phenomenal. They’re game-changing results. The first one we decided, “Let’s not test calcium alone. We know that the early studies on calcium alone had zero effect on bone density. We knew that you have to add vitamin D before the calcium studies started working.” Now same thing with the early vitamin D studies, zero results on bone density or bone strength, so they had to combine them. So we used that logic and we said, “Well, you know, there’s some good science with vitamin K2. There’s some good science on strontium. There’s some science on magnesium and all these things. Why don’t we put it all together? Let’s put them all together and study the group.” Now it’s not gonna prove that AlgaeCal itself is better, but it’ll prove that this complex together is a better way if it works out. So we combined all the supported natural bone ingredients. We looked at both men and women aged 18 to 83. It’s a big study. And we compared two AlgaeCal formulas. University of Texas principal investigator, Joel Michalek, we looked at six months bone mineral density and annualized it. We also looked at safety because we wanted to ascertain human safety in the product. We’ve already done toxicology tests on animals, but it’s important to also look at human safety. And it has just been accepted for publication in Nutrition Journal, so this is brand new information. Bone studies one and two showed adults increase bone density in one year or less with AlgaeCal formulations, but the question of what happened to bone density in years following remained unanswered. This study showed women in their mid 60’s gained 7.3% more bone over 7 years – and that it happened in a linear fashion with about 1% added per year. Safety was well established by a panel of 45 blood chemistries drawn at baseline and ending. This is significant given recent studies suggesting traditional calcium supplements may increase cardiovascular risks. Does taking calcium worsen or cause bone spurs?